Baie Verte Peninsula of Newfoundland. Time to 'check-out' of Gros Morne National Park and leave the Northern Peninsula. We drove back along Highway 431 away from Tablelands towards Woody Point stopping briefly at the Discovery Centre again for a shot of Bonne Bay from behind the town of Winter House Brook. We headed south towards Deer Lake on Highway 430 (Viking Trail) and stopped in at the Newfoundland Insectarium and Butterfly Pavilion. A fun and educational visit, the main building was once a dairy barn built in 1946, then converted into the insectarium and butterfly pavilion and opened in 1998. Parts of the original frame of the building have been preserved and used in the refurbishment of the facility. The main building features a variety of wall mounted and floor exhibits of butterflies and insects from around the world which are interspersed with live exhibits. Visitors can view the life of a honey bee through the observation beehive where bees have access to the outdoors by way of a tunnel. There are live exhibits of tarantulas, scorpions, and a variety of insects. In the pavilion are the live tropical butterflies with wings of vibrant colours and camouflage spots and stripes. Some barely sit still long enough to photograph as they flutter off on a journey towards another flower or to perform acrobatics with others of their species. Be aware of those who are not too shy to sneak a ride on your tripod or your shoulder - you need to check for hitch-hikers before you leave the pavilion. The gift shop there is just wonderful and someone like me could spend a lot of time (and money) in there. The prices are extremely reasonable and there are many decorative items with a distinctly butterfly or insect theme - lucky for Rolf we are living in a camper and there is simply no room for knickknacks, but we could be back!! After an enjoyable visit at the Insectarium we continued on towards the Baie Verte Peninsula. The main road (Highway 410) on the peninsula is also known as the Dorset Trail and we followed it to the town of Fleur-de-Lys at the northern tip. The town is a beautiful seaside community with a protected harbour and neat homes which line the waterfront. The area is steeped in Dorset Indian history and features a soapstone quarry site which visitors can take a 5 minute walk, from beside the museum, to view the carvings. At the very end of the road in the town of Fleur-de-Lys is the Ocean View Trail which is approximately 800 metres long - again an easy walk on boardwalks and dirt paths (park at the museum). 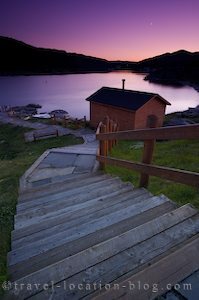 At the end is a viewing platform which looks out over the ocean and beautiful coastline at the northern end of the Baie Verte Peninsula. Since it was still iceberg season, we were lucky to see icebergs just offshore from the viewing platform. It was a beautiful place to watch the sunset. Before the light got too dim, we had to start the walk back to the trailhead - since we didn't have a torch with us. Off the side of the road back near the museum was a pretty picnic area on the harbour front which offered another great platform for photographing during the sunset, so we hung out there until the light disappeared completely. We decided to spend that night at the picnic area right beside the museum, and so ended another great day. Check out Part One of our blog for July 17, 2007 about the Tablelands in Gros Morne National Park of Newfoundland.